Topics: Athlete Registration Form, Athlete Waiver, Arden Hills, and Central Lakes. Age: It went live on May 8th 2000, making it over 17 years, 11 months old. There are 2 Nameservers, ns51.domaincontrol.com, and ns52.domaincontrol.com. It is hosted by Godaddy.com Inc (Arizona, Scottsdale,) using Apache web server. 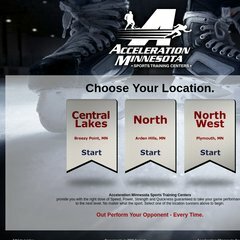 Accelerationmn.com's server IP number is 72.167.131.223. PING (72.167.131.223) 56(84) bytes of data.